If you were one of my neighbors, you would have seen my dog, Vinny, running around the yard completely decked out in his Halloween costume on this January morning. Here’s the thing: I was outside doing horse chores and, as always, young Vince had a ton of energy to burn off. He stood at the kitchen door longing to go outside, watching his sister Blue bask in the cold but sunny morning. But he refrained from crossing the threshold because of the cold air kissing his nose. I knew Vinny would appreciate a little time outside as long as he didn’t feel too cold. So, I shoved his Halloween costume on him because it is lighter than his heavy winter coat and literally pushed the 50-pound pitbull out the door. Sometimes you just have to wing it and do what works. Halloween in January worked. Rounding out this unfortunately cold day was a nice, warm dinner. 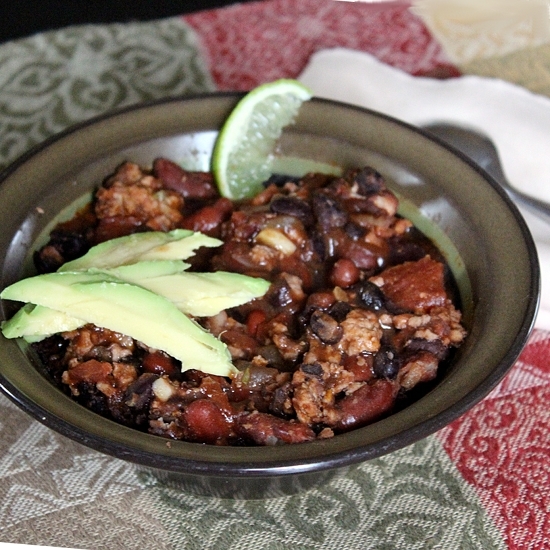 On a cold day, nothing sounds more appealing than a hot bowl of chili. As I searched high and low for a can of tomato sauce in my cabinet (as ground turkey and onions sizzled away on the stove top), I came to the slow realization that I ought to abort the chili mission. There was no tomato sauce to be found. Thinking back to the morning’s Vinny improvisation, I decided that perhaps a can of enchilada sauce would do just fine in my chili. It had roughly the same spices I would add anyway, so I decided to go for it. In a skillet over medium heat, brown ground turkey and diced onion together until turkey is cooked thoroughly and onion is golden. In a large saucepan or medium dutch oven, combine ground turkey and onions, beans, enchilada sauce, cumin, and diced tomatoes. Mixture will be a bit thin. Salt to taste. Simmer 45 minutes until desired consistency, as it thickens as it cooks. Top with diced avocado and fresh lime. This entry was posted in Brady Evans Venables, Cooking, Food, Recipes and tagged Brady Evans Venables, chili, Columbia, columbia sc, cooking, every woman blog, Famously Hot, food, hospital blog, Lexington, lexington medical center., lexington sc, Lexington Women, lmc, LMC every woman blogger, Midlands, Midlands Women, Recipes, South Carolina, South Carolina Women, Turkey Enchilada Chili, Women, women's blog, women's hospital blog by Kate Gillmer. Bookmark the permalink. I love chili this time of year! I would have never thought to use enchilada sauce and can’t wait to give this recipe a try! Thanks for sharing!